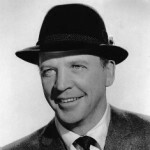 Daniel James "Dan" Dailey Jr. was born in New York. He was an American actor and dancer. He appeared in a minstrel show in 1921, and later appeared in vaudeville before his Broadway debut in 1937 in Babes in Arms. His performance in their film When My Baby Smiles at Me in 1948 garnered him an Academy Award nomination for Best Actor. In 1950, he starred in A Ticket to Tomahawk, often noted as one of the first screen appearances of Marilyn Monroe, who played a very small part as a dance hall girl.